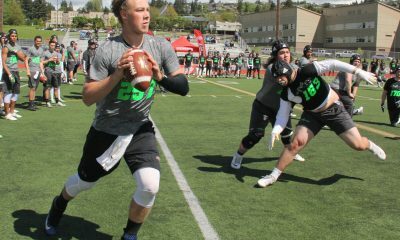 Elijah Elliott is a 2020 Rising Star from Jefferson High in Portland, Oregon. He may be young but he was one of the fastest recruits at Camp and most skilled. He is a big time talent on the rise. 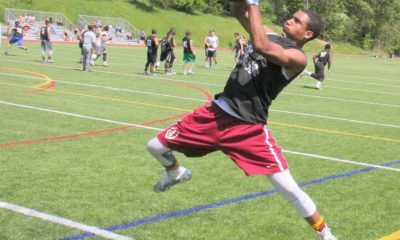 Giovanni White shown here on Defense is a D1 recruit from Lincoln HS in Tacoma and at 6’3″- 285 lbs he is a major force. He has two seasons left and will no doubt be a Pac 12 D-Tackle and OG/Center. 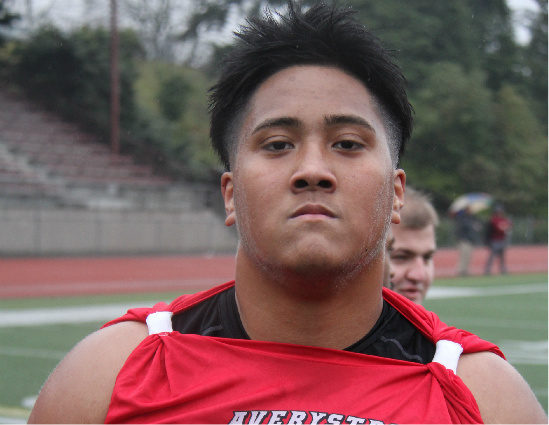 Gio is one of the best linemen in the Pacific NW in any class and he showed that at Camp. Tyler Ganoung seen here on the OL is 6’5″-310 lbs and a very solid line prospect. 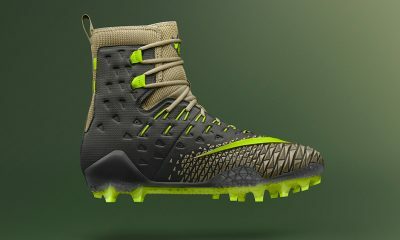 Tyler showed great pass pro technique only losing one battle and he can punish opponents. As he transforms his body he rises up higher. 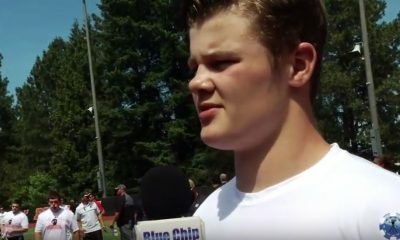 A very good oline prospect for his 2018 Class. Alexx Schmidt is a 2019 Prospect out of Todd Beamer HS in Washington. This kid blew up at the NW Stars camp showcasing superior strength and ability and a brand of toughness the great ones all have. He is 6’3″- 270 pounds and it appears he is on his way to making a serious case that he is a top line prospect for the future! Solomon Hines of Kentridge HS showcased blinding speed (4.48 40) and great length and size in the RB session. He has long arms, moves well in space and projects as a big time Athlete. We were impressed with this kid all day long! Kylan Touch from Aberdeen HS was for sure a top 5 Camper on the day. This young man displayed sick skills at the RB position and came back and totally owned the DB section of camp 3 hours later. He is 5’8″ and 175 lbs and so quick. Any college will be very wise to lock down on this kid; he is very special. Mick Johnson is a 2018 RB/DB from Steilacoom HS (WA) who was on point all day. He has a great stutter step and broke ankles in the drills and showcased serious speed too! Yousef Koborsi from Liberty High in Hillsboro, Oregon was rolling all camp. The LB / RB was explosive, on point, and tough all day. He may end up as a Safety but there is no doubt he is in the conversation about who is the best in this 2018 Class. Sage Leigh has played 1 year of HS FB. At 6’5″- 225lbs this long armed Defensive End is a Stud! He has a bright future and dished out some serious trouble for the many top O linemen at the NW Stars Camp. Sage was a break out performer at the Camp! Carson Shuman of Helena (MT) is 6’4″- and 275 lbs and he came out to make a name and he did just that. This guy is a grinder and he is superbly tough. He had a really nice camp and deserves a look. He is at Capital High.